I’m pretty inconsistent about celebrating minor holidays. Sometimes I go all out, sometimes I let them pass me by. This Valentine’s I split the difference and made a little gift for the Turtle while agreeing with the husband that presents weren’t necessary. 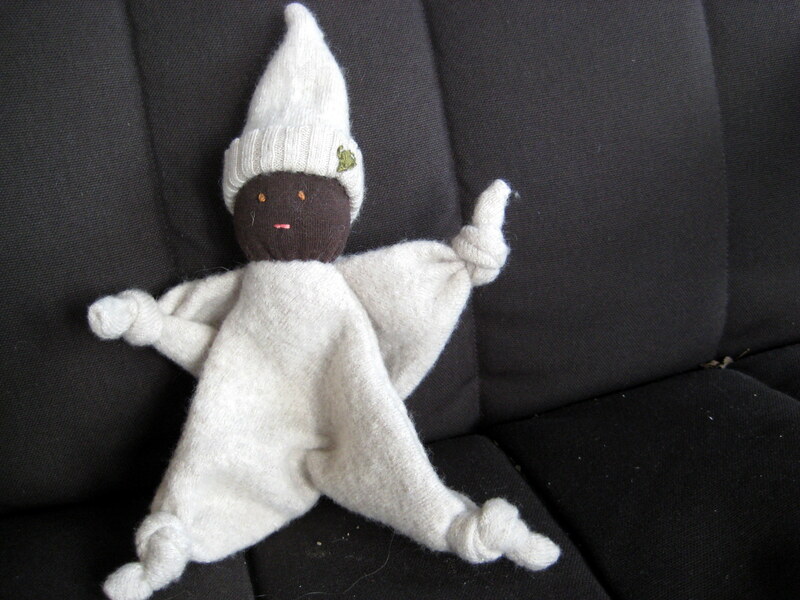 Made from the Star Seed Baby pattern in this winter’s Living Crafts Magazine. (Interesting note–while a star seed does indeed seem to be a seed shaped like a star, if you are to google “star seed baby” you will get mostly websites about aliens incarnated as human babies. I’m going to assume the project title comes from the first definition.) It took a lot of adjustments to make the above doll–completely different measurements and pattern shapes–but since it was a small, simple project it still only took a baby-free afternoon of cutting sewing and an evening of embroidering. Made from a thrifted sweater (bought to felt and cut) and an old T-shirt. So that felt good, too. Turtle’s not too interested in stuffed animals, and this is his first doll. So his reaction to the doll’s presentation yesterday was to toss it aside (literally) and play with the box that his gift from the grandparents arrived in. But today I tucked it in the crib with him at naptime, and he fell asleep on top of it, little hat sticking out under his belly. So there’s hope that this might be a treasured toy, afterall. Ah, February. The dark days (and a rather simple point & shoot camera) make it hard to take photos worth sharing. Thank goodness for the “I’m feeling lucky” button on Picasa, at least I can add enough light and contrast so you can tell what’s in the picture. I just went cruising through the recent pictures to see if there was anything worth blogging. Photos of lots ready for ebay (I have discovered the ebay, oh! that could be another post), a few shots of the Turtle with bad lighting that just turned out sloppy, and then this one, that’s at least a bit hopeful. Curtains. I’m (slowly) making curtains for our living room. 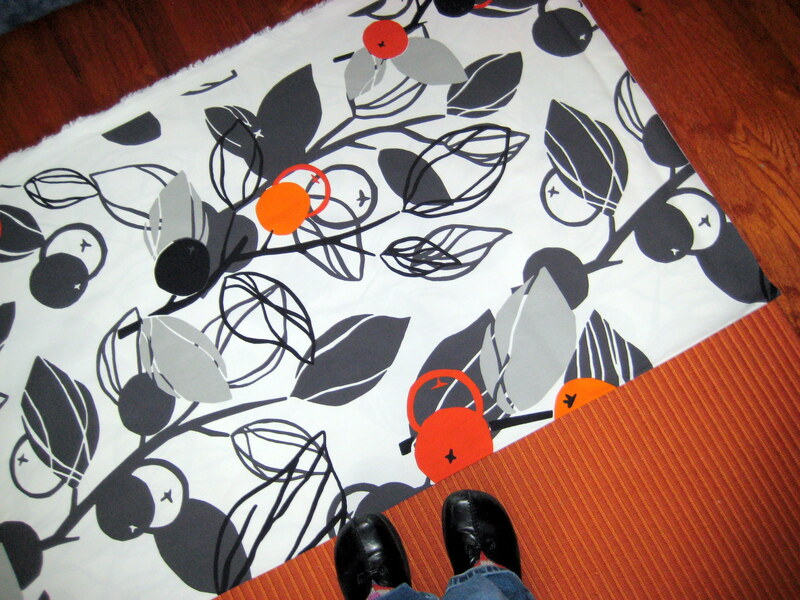 Loving this Ikea print, and those bursts of orange. Also, loving that the orange rug has stripes, so I used the rug as a cutting table, measured out my length, and got (mostly) straight lines. A bit of color to warm up windows looking out on cold, gray days. I’ll take any help I can get to brighten up February. Christer’s been working from home the past several days, a treat brought to us by his between-semester break. Late breakfasts, lunches together, the boys skipping out post-work and post-nap for a hike, all of us getting some time to relax together. Doing the one-parent-working and one-parent-at-home thing can lead to some lonely days–for him as well as for me I’m sure. Short breaks like this are such a boost, and I’m grateful to Christer’s academic schedule for these chances. Mix the increased family time with the cozy hibernation of this time of year, and I’m feeling refreshed enough to make it through February. Also, the extra help let me find time to start making curtains for the living room. Because February will be so much easier with a bit of orange hanging from the windows. Knitscene and I have a love/eh relationship — it seems like the issues are either a bit cringeworthy or superb. The latest issue was a must-buy, and I’ve spent more time flipping through it than any magazine in the last year. I’m seriously in love with several of the sweaters, and I quickly cast on for one of the shawls. It’s a fun construction, a bit off center, no bothering with edging or borders. I’m not sure how they got the dimensions shown if the called for yarn really is laceweight–I already added several repeats of the second chart, and will probably add a few of the third as well, and it still seems small. Nevermind, it’ll probably get more use as a neck-scarf than as a shoulder shawl. And although the first few stitches of each row require some counting, the rest repeats along happily–a good combination of interest & ease. Getting out of the house is a challenge this time of year. It’s cold. And there’s a baby to bundle and snowpants to find and coats to zip. And when all that is complete, there’s no assurance that the baby will go along with the plan. 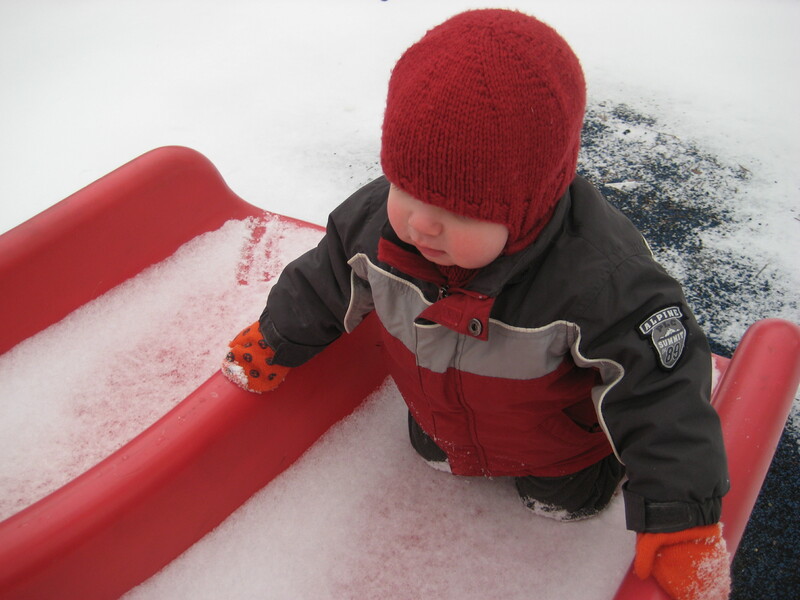 (A couple weeks ago there was a decent snowfall, and we tried Playing-In-The-Snow with the Turtle. And he stood there, snow past his ankles, and cried.) I do well at getting out in the car–driving to indoor playgrounds, or just the grocery store, and that change of scenery is useful. But getting outside just to get outside? Not so good at remembering to do that. Yesterday, though, I got out the coats & zippers and we headed to the park. We were the only ones there. But, Turtle was game, and explored the silent playground. He had just figured out slides as the weather started to get nasty back in November, and I was entertained to see that he remembered — climb up the stairs, wait at the top for mama to get you pointed feet first, push down, repeat. And the dusting of snow was much more Turtle’s speed. Training snow, if you will. Today is crazy cold, but sunny. And I will take sunny over cloudy regardless of the temperature, so we managed to walk to run some errands this morning. Came back very cold, but much happier than if we’d stayed warmer in the car. 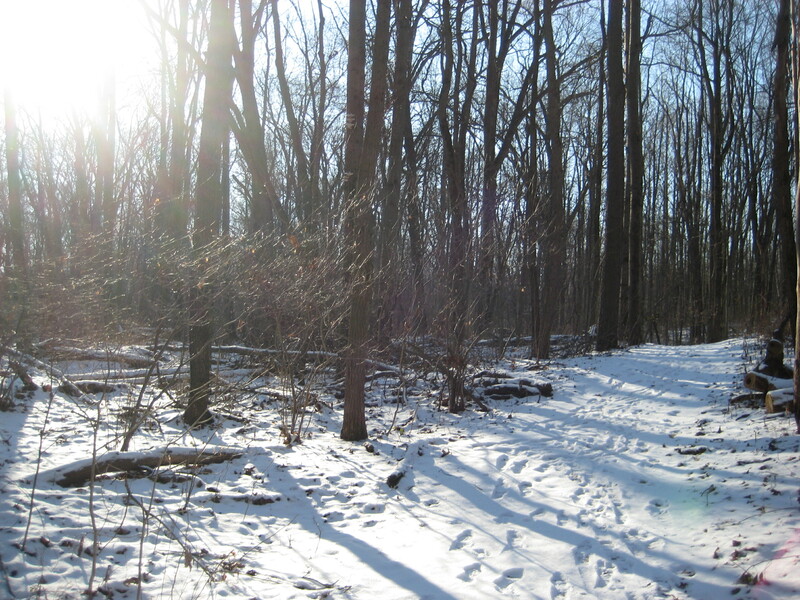 Note to self – it really is worth finding the snowpants. Oh, and the hat? A brilliant handknit gift (thanks Laura! ), Knitty’s Toasty Topper. Keeps the ears & chin warm. And when it slips over his eyes he toddles around giggling like it’s a game of peekaboo. It might have been nearly two months ago, but it was a Happy Birthday for the Turtle. Let’s see how much I can remember. The celebration was small, just mama and papa and Turtle, and the grandparents on the webcam. There was cake, of course, and pictures of a baby grabbing at cake. 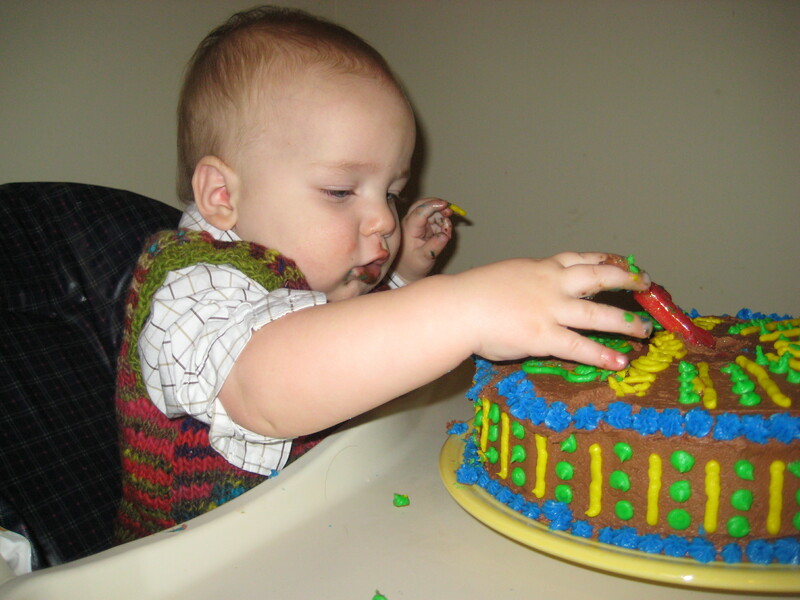 His first handful was blue frosting, and once he realized it was tasty he kept plucking off the blue bits. It took some convincing that the rest of the cake was sweet, too. There were presents, and unlike the normal story of the baby having more fun with the wrapping than the toy, he didn’t show much interest until the toys were revealed. 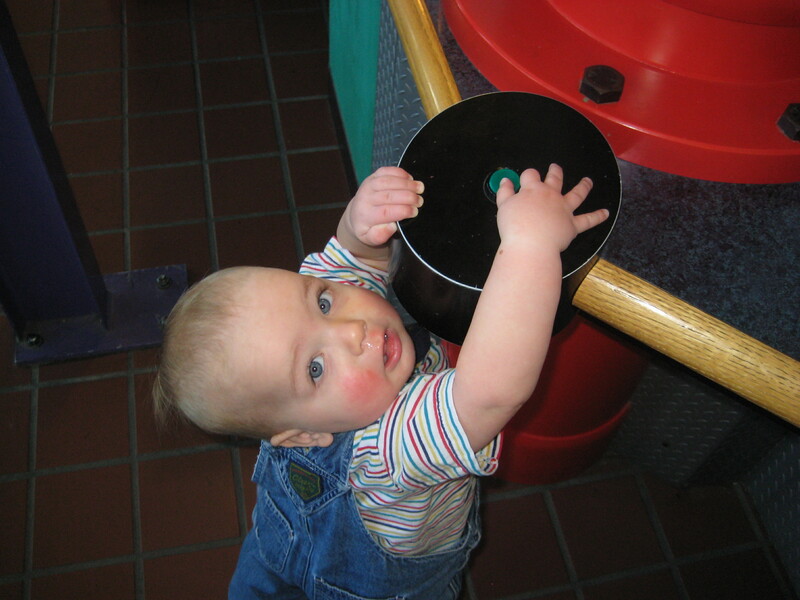 Noisemakers were the favorite for the giving and the getting–a block with a jingle bell inside, a xylophone, musical rattles. I stained & finished a stepstool for him, which he didn’t show much interest in, but will enjoy as he learns to climb. He allowed his birthday crown to sit on his head for part of the night. 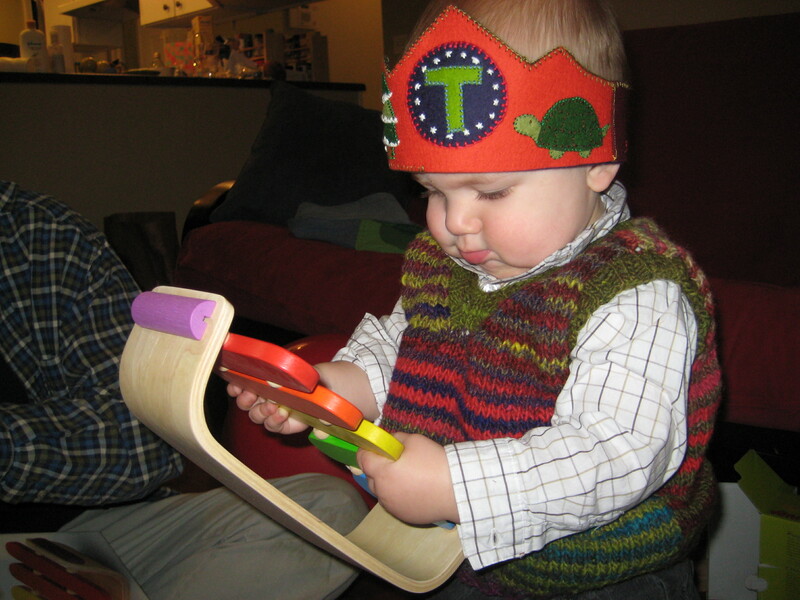 And the vest he’s wearing was another handmade component. I’ve completely fallen for knitting vests, and for my little Turtle in vests, and so I see many more special occasion vests in the future. As for the month leading up to the birthday–it was all about the walking! Turtle started the month lunging his nose forward and hoping his feet would follow for a step or two before he fell. Midway through the month he figured out how to keep the rhythm going across the room, and he was off. Those first few weeks he wore himself out with the walking–his naptime spiked (useful, since his getting-into-stuff time also spiked). He looks so grown up walking around. We finished the birthday celebration with a trip to the local children’s science museum. The trip was a birthday present, even if he didn’t know it. We wanted to take a special outting that would be fun for him. 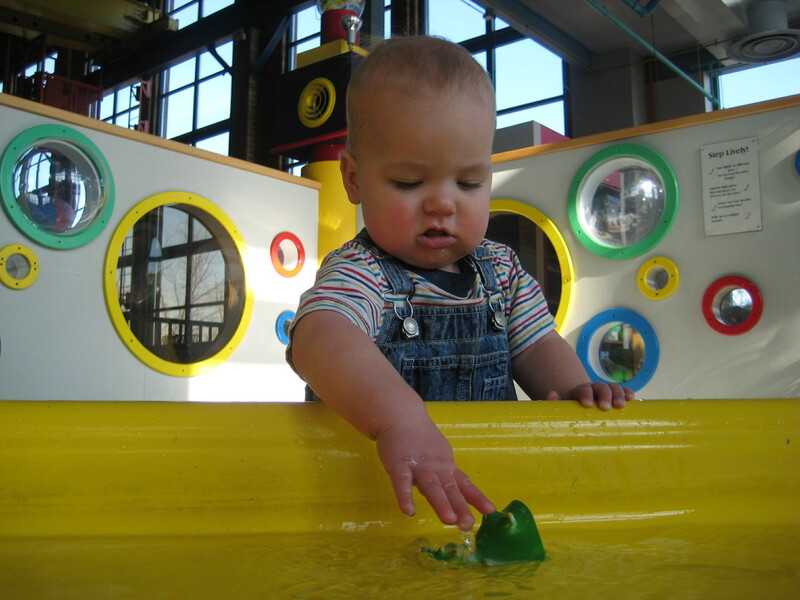 There was a great toddler area, complete with a water-play table. And when some kid threw up in that, we headed out to explore the big kid exhibits. Turtle probably didn’t learn much about magnets or electricity, but he’d love to tell you all about the buttons he pushed. He’s a big fan of buttons. It’s time for a meta-post, a post about posting, a manifesto to get me excited about blogging again. I wrote one of these nearly a month ago, but never published for lack of pictures. But I’ve found the camera cord, we’ve settled into the rhythms of cold-weather post-Christmas child-chasing, and chilly evenings indoors find me with more time to play at the computer. That and I keep finding myself composing blog posts in my head, and I ought to take that as a sign & get this up and running again. I’ve been pretty quiet around here lately. And that’s left me thinking about why I blog and should I blog and all of that. And I think I’ve concluded that this is something I want to continue. 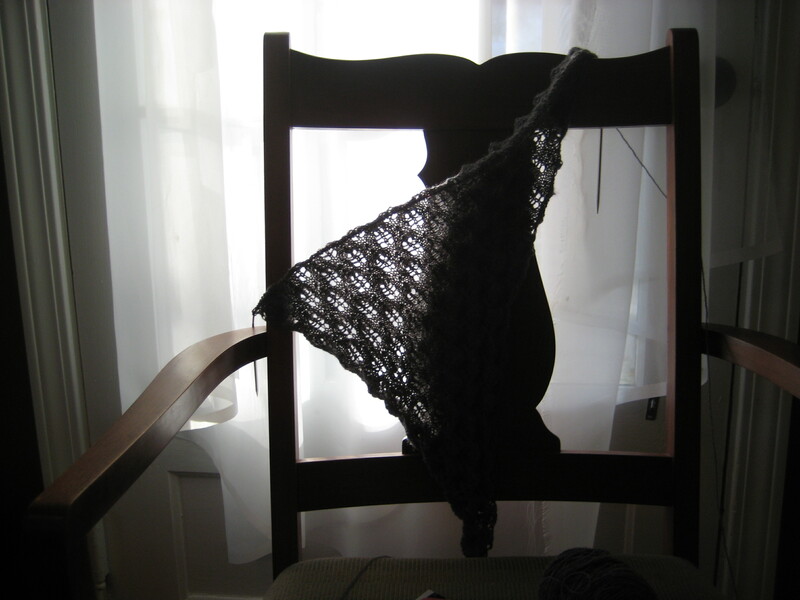 This space has become less about knitting, and more about general family stuff. I get inspiration from so many blogs that I read–but my blog isn’t about inspiring my readers (reader? maybe?) so much as it is about reflecting on the little steps I take here and there to find a place for creativity in my life. I find myself composing little blog post in my head about the things I’m proud of accomplishing–whether it’s finishing a knitting project or managing a meal from local ingredients, or pausing in amazement as I watch the baby play. So maybe understanding why I keep up this blog will mean that I’ll feel more comfortable posting more often. Or maybe it won’t. We shall see. So, the first blog project is to finish up my year of baby posts. With a post about his birthday, two months late. I think I’ll start on that tomorrow.